The advent of the Internet led to the invention of new terms that are exclusively used to refer to things that you can do or get from the Internet. Website is one of the very first and it is used to refer to a location that hosts several pages that are often on the same topic. The site is accessed with the use of a URL (Uniform Resource Locator). On the other hand, a web application is a term used identify a program or application that is run and used on separate computers. A web application can exist in the Internet or across a local network, Intranet, VPN, among other things. When a web application is available in the Internet, it is often hosted as a separate page on a website. The site can also contain other materials that are not used by the web application but are often related to what the web application does. Comparatively, a web application is more resource intensive compared to a website that does not contain a web application. Depending on the type and goal of the web application, it needs to process the data it gets as well as access databases. Although some of the more complicated sites can be as resource intensive, most are not. This is because most sites simply show information that are static and are not updated very often. Ben Joan. 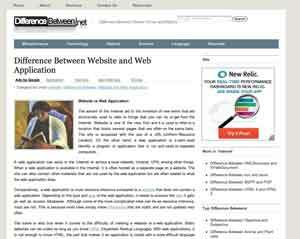 "Difference Between Website and Web Application." DifferenceBetween.net. September 6, 2011 < http://www.differencebetween.net/technology/internet/difference-between-website-and-web-application/ >. Yes, this is the most sensible differentiation I’ve read. Very useful explaination. But still, can you provide some specific examples?? I agree. It would be much better if you could provide some examples. Waaay too technical an explanation for me–I guess he was speaking to a different “choir”….